During this period, Durocher, who had made his screen debut in the 1943 Red Skelton comedy Whistling in Brooklyn, played himself in many television shows. In an April 10, 1963 airing of The Beverly Hillbillies, Durocher plays golf with Jed Clampett (Buddy Ebsen) and Jethro Bodine (Max Baer, Jr.) and tries to sign Jethro to a baseball contract after discovering Jethro has a strong pitching arm. In an episode of The Munsters titled "Herman the Rookie," on April 8, 1965, Durocher believes Herman (Fred Gwynne) is the next Mickey Mantle when he sees the towering Munster hit long home runs. Football great Elroy Hirsch also appears with Durocher. Three years earlier, he also appeared as himself in an episode of Mr. Ed, when the talking horse gave batting tips to the Los Angeles Dodgers, helping them win the pennant. Durocher also appeared on television in the early 1950s on the CBS game show What's My Line? twice as a mystery guest (January 28, 1951 and May 31, 1953), the latter when his wife Day was a guest panelist. If no announcement has been made about what my title is, I'm making it here and now. I'm the manager. I'm not a head coach. I'm the manager. Durocher had real comedic talent, and portrayed himself on episodes of The Munsters, The Joey Bishop Show, Mister Ed, The Beverly Hillbillies, Screen Directors Playhouse, and other shows. In the 2013 film 42, Durocher is played by Christopher Meloni. ^ Spatz, Lyle, ed. (2012). The Team That Forever Changed Baseball and America: The 1947 Brooklyn Dodgers. Lincoln, Neb. : University of Nebraska Press and the Society for American Baseball Research. p. 23. ISBN 978-0-8032-3992-0. Retrieved March 5, 2016. ^ "Leo Durocher Baseball Stats, facts, biography, images and video". The Baseball Page. Retrieved December 3, 2013. ^ "Little League Home Runs Database". SABR. Retrieved April 17, 2017. ^ Banks, Kerry (2010). "Baseball's Top 100: The Game's Greatest Records". Vancouver, BC: Greystone Books. p. 55. ISBN 978-1-55365-507-7. ^ "Catholics Quit Dodgers Knothole Club In Protest Over the Conduct of Durocher". New York Times. March 1, 1947. p. 17. Retrieved March 4, 2016. ^ "Laraine Day and Durocher Are Married In El Paso After She Gets Mexican Divorce". New York Times. Associated Press. January 22, 1947. p. 25. Retrieved March 4, 2016. ^ a b c d e "Leo Durocher". Baseball Reference. Sports Reference. Retrieved September 25, 2015. ^ Effrat, Louis (April 10, 1947). 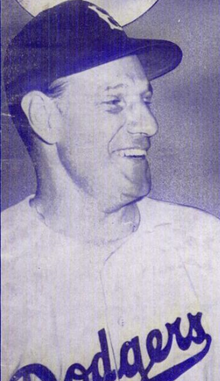 "Chandler Bars Durocher For 1947 Baseball Season". New York Times. p. 1. Retrieved March 4, 2016. ^ "Durocher, 62, Is Married To Prominent Chicagoan, 40". The New York Times. United Press International. June 20, 1969. p. 46. Retrieved March 5, 2016. ^ Oxford University Press, American National Biography: Dubuque-Fishbein, 1999, page 158. ^ "Leo Durocher". IMDb. Retrieved September 19, 2018. ^ Fretts, Bruce (April 12, 2013). "Christopher Meloni channels his inner loudmouth as Dodgers skipper Leo Durocher in '42'". New York Daily News.